It’s seven on a Tuesday night in San Antonio, and Henry Cisneros–the city’s most recognizable political figure and its former mayor–has gathered a group of Latino leaders in a tiny auditorium. Sitting in the audience are several of the city’s movers and shakers, including Latino bank executives, members of the city council, the president of the Hispanic chamber, and Mary Alice, his wife of thirty-nine years and herself a councilwoman. They’re holding glasses of wine and longnecks and waiting for Cisneros to address them. Had a television camera been there, it might have looked like Cisneros, the charismatic politician who was considered for vice president by Walter Mondale and later served on Bill Clinton’s Cabinet, was about to make a big announcement. Instead, he had gathered them to watch a new independent movie, August Evening, by a young South Texas filmmaker with a Latino cast. Thirty years ago, Cisneros probably would have never have ventured so outside the political realm. Back then, he was a young man in a hurry, the first Hispanic mayor of a major U.S. city and too busy to even watch a movie. Now, Cisneros is an elder statesman relishing that role, a man who can make time for a pet project such as encouraging influential friends to fill a theater in support of a Latino film on its crucial opening weekend. Yet he still lives in the same house that he did as mayor, though it has undergone substantial growth and looks more like a compound. It rests on San Antonio’s West Side, in a neighborhood called Prospect Hill. It’s a historic but predominantly poor area where the city’s biggest wave of Mexican immigrants landed before and after the Mexican Revolution of 1910. It’s also the location of the Cisneros family’s nonprofit, American Sunrise, with offices in a quaint Queen Anne-style home right around the corner. Across the street from American Sunrise are two other historic structures (one is comedian Carol Burnett’s childhood home recently acquired by the nonprofit) that will serve as after-school sites for neighborhood schoolchildren. Other philanthropic interests include serving on the board of the Broad Foundation in Los Angeles and the advisory committee to the Gates Foundation. They parallel his longtime work to build political power and financial strength in the Latino community. But Henry Cisneros is still a politician. He can’t help it, even if he has purposely taken a back seat in his own wife’s campaign and career. He is still sought out for counsel. A long line of up-and-coming Latinos (and non-Latinos) seek not only his advice but his blessing. A public appearance with him remains a major endorsement for a young politician, and Cisneros can still command an audience and stir it into applause with his powerful charisma. Sometimes, fans and supporters line up to shake his hand and ask if he’ll ever consider running for office again. Those circumstances concern Cisneros, the entrepreneur. The mortgage crisis, the economy and, to a certain extent, the energy crisis are interrelated, he says, and “You begin to address the economy by getting a handle on the mortgage situation, and my framework has been that you need to do four things.” This is when Cisneros, the politician, launches into a four-point plan to solve the nation’s ailing economy. He sounds presidential, a hope that so many Latinos had for him. He isn’t sad that things didn’t turn out that way. Those hopes were dashed by an extramarital affair that turned into a political scandal for the Clinton Administration, which was followed by a decade-long investigation by a Special Prosecutor that cost almost $22 million. Cisneros was charged with lying to federal investigators about payments to a former mistress, and Clinton pardoned him in 2001. But friends say Henry Cisneros doesn’t live with what ifs. Cisneros is also at work with Hispanic advertising pioneer and longtime Republican Lionel Sosa on “Our Pledge,” a fifteen-year plan to help immigrants embrace the American way of life. Its key points are learning English, educational advancement for the children of immigrants, home-buying and job advancement. It’s Cisneros’ answer to the hateful anti-immigrant crowd and its leader Lou Dobbs, which has made Cisneros stop watching CNN entirely. 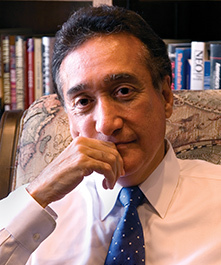 This year, Cisneros turned sixty-one. Age hasn’t stopped him from rising early to work out (he alternates running and weight training), and devouring books on all manner of topics in his three well-organized libraries. For his birthday, his wife gave a dinner party in Los Angeles, where their two daughters live and their son attends college, and then another celebration in San Antonio, for old friends. More than ever, he enjoys his role as doting grandparent. Though he travels with several books in tow, he has now added gift catalogs. When he’s not reading on a flight, he’s reviewing potential gifts for his grandchildren, three girls and a boy. Somehow, he found time to talk with LATINO Magazine in his office on the banks of the San Antonio River. What was your role in the Obama campaign? I basically said to [President-elect] Obama, ‘Send me where I can persuade the most people and where you need me, and particularly where you think Latinos can make a difference in the state.’ I got a request every day to do something. Describe the anti-immigrant sentiments heading into the presidential race? Republicans tried to make immigration a wedge issue. It didn’t work. The most strident voices on immigration, such as Tom Tancredo, never became a factor. Candidates that changed their pro-immigration stances to become harder on enforcement, such as Rudy Giuliani and Mitt Romney, fell out of the race. The last man standing on the GOP side was the person who was the most reasoned. Why have you stopped watching CNN? I’m saddened that they have ruined a perfectly good network that many of us used to think of as the authority on the news. [Lou Dobbs] is a Johnny-one-note that bashes immigrants, that bashes Latinos and that bashes the government every night over and over. It’s cynical, and he’s doing it for ratings. It’s arrogant and hurts the country. What factors helped Obama win the White House? The last few months of the campaign coinciding with the economic toppling allowed Obama to show his good judgment, his steady hand as opposed to McCain’s erratic behavior — when he said the fundamentals of the economy were sound, then postponed his campaign. It was not a confidence-inspiring performance at a critical time. It was almost juvenile. By contrast, Barack Obama was steady, said the right things and gave the impression of a solid leader. When the economic crisis began to flare, Obama took the lead and never gave it up. How did Obama win the Hispanic vote? My personal belief is that Latinos are very practical in their politics. They chose and understand the issues in their own interests. The candidate with the most aspirational agenda on education and jobs and a better appreciation for the needs of working people was the candidate that wound up winning their vote. We have a long history of voting in own interests and in voting for those who understand the importance of collaboration. People obviously see the historic dimension of this, but our people are very practical about our progress. Obama was the candidate who could deliver that to the Latino community. What challenges will Obama face with Latinos? The first challenges that our president-elect will face are related to the two crises of our time: the extraction from the war in Iraq in responsible terms and stimulating the economy and putting the country back on a positive track. Latinos have a stake in both of those. What we want going forward cannot be done in the first year. But over the course of his term, we want more educational opportunity, comprehensive health care, immigration reform and strategies related to job readiness and wages. Those would be on the agenda of most Latino families. What advice would you give Obama? He seems to do very well with his present circle of advisers. So, I would just say to keep his eye on the needs of working people of the country who were the core of his base and to not get distracted with inside-the beltway dialogue, by the trappings of the office, by the bubble the president is put into, by the inane debate that always occurs about petty and peripheral things. Tell us about your company, CityView. CityView aggregates institutional capital principally from large pension and retirement funds across the country and applies it to building homes that working families can afford. … It’s proven to be very attractive to them because the very people whose retirement funds they are investing are buying these homes. What we focus on is urban, for sale, as opposed to rental housing, for working families at the entry level. That’s our particular niche. Where does your passion for housing come from? As mayor, I came to respect housing as a place for people to live, a decent platform to live in a stable, decent, safe, clean environment but also as an economic investment. For many, the equity in their home is their wealth. More recently, I’ve come to see housing as a transcendental thing. Our self-image comes through in our homes. It’s where our family is, where we retreat, it’s our respite and where we keep our treasured possessions. It takes on many dimensions of the human experience. What is your role in Mary Alice’s political career? Because she holds the [city council] seat that I first held in 1975 and ran for mayor from, there is a natural carryover. It has benefited her initial effort. But I’ve tried to make it clear that she is the political person, and I’m not standing behind the curtain or pulling the strings. Besides, she can make the calls herself and is fully capable of it, and it’s the only way it can be. My oldest daughter Teresa [Cisneros Burton] is a lawyer. She’s married with two children, Russell and Grace. They’re doing extremely well. [Her husband] Sean is the president of our firm. Mercedes [Cisneros Badger] is married to a former classmate who’s finishing up a career in the NFL. They have two girls, Natalia and Karina. She’s a fulltime mom. John Paul is at USC studying real estate finance and urban planning. … Someday he may work for us. I regret some of the mistakes I’ve made of a personal nature that hurt people, my family especially, and disappointed others. But those are motivating things that hopefully keep us from making similar errors and keep us working harder at trying to be a better person. I’m blessed to have lived and to have matured in career at a time when the Latino community is coming into such prominence in our country and at a time when so many things are possible. I’d like to think my contributions are in the realm of promoting the Latino emergence economically and politically.